We offer major brand HVAC whole-house air cleaners for your home or office furnace and air conditioner. Having a built-in air purifier ensures you're able to remove particles from every room at the same time. An efficient air cleaner removes the particles that can aggravate allergies and cause illnesses and improves overall indoor air quality. These units are quiet, effective and easy to maintain. Air cleaners can work in three ways to remove particulate matter: using media, an electrostatic charge or a HEPA filter. A media filter unit pulls out particulates with 70 percent effectiveness, removing particles as small as .3 microns. Electronic air cleaners use an electro-static charge to collect particles, proving to be 94 percent effective for such small particles. 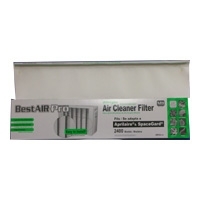 HEPA air cleaners provide the most effective solution to whole-house air cleaning. These units can trap 99.97 percent of all particles down to 0.3 micron. If you have questions about any of our high-efficiency air cleaners and filters, please contact us! Air CleanerCabinet Size: 24.81" x 25.38" x 8.1"
Air CleanerCabinet Size: 22.31" x 23.38" x 8.1"
Air CleanerCabinet Size: 18.31" x 23.38" x 8.1"
Exact Size: 27.38" x 22.06" x 6.75"
Exact Size: 30.06" x 17.75" x 6.75"
Exact Size: 31" x 18.25" x 12"
Cabinet Size: 17" x 23.75" x 7.5"
Cabinet Size: 17" x 26.5" x 7.5"
Cabinet Size: 22" x 21.75" x 7.5"
Cabinet Size: 22" x 26.5" x 7.5"